Does the Re camera remind you of anything? HTC is taking on a brand-new category with a device that could give products like GoPro pause. Meet the HTC Re handheld camera. It doesn't get much simpler than this. There's no zoom, no mode dial, not even a display to check your photos. You grip the HTC Re in your fist, press once to grab a 16MP still and press a little longer to start shooting a Full HD movie (it can also shoot slow-motion and time-lapse footage). The HTC Re has a 146-degree super-wideangle f/2.8 lens, so this is a camera for capturing what's happening right now, right around you, not things that are happening far away. HTC thinks your camera shouldn't get in the way of what's happening in the moment, and it might just have a point. How many shots have you lost fiddling with your compact camera's mode dial or zoom setting? And can you really experience the moment while you're staring at a screen on the back of a camera? First teased in a video in September, the Re camera is a portable, durable camera meant to be used for everything from surfing to selfies. According to the Re website, it camera will be available for $199.99 (about AU$226, a £200 price tag is possible for the UK). The RE won't please photographers who want to spend some time composing their shots, tweaking the settings and perfecting their perspective, but that's not what it's for. Regular cameras demand your attention and get between you and the thing you're photographing, but the HTC Re gives you nothing to look at and nothing to distract you - you just point it the right way and get on with your life. There's no power button; a grip sensor activates the camera when you pick it up. Stills and movies are recorded to the 8GB microSD card supplied with the camera, and you can slot in a bigger capacity card (up to 128GB) if that's not enough. A convenient new way to capture photos? The Re also has a button dedicated to slow-mo videos. HTC Americas President Jason Mackenzie said that thanks to the camera's wide-angle lens and stabilization features, you'll be able to capture what you want despite the lack of a screen or viewfinder. However, if you want to see what you're shooting as you shoot it, you can hook up the HTC Re to your smartphone and its dedicated app, which will be available in Android and iOS versions. Or you can just use the app to skim through the stills and videos you've already captured. You can have your images backed up automatically to your smartphone or the cloud, and HTC even has plans for live YouTube streaming. An SDK is forthcoming, and look for frequent Re updates. It might be tempting to write off the HTC Re as a low-rent novelty, but the specs suggest that HTC has thought this through. This isn't just a smartphone camera in a tube. The HTC RE uses a 16MP 1/2.3-inch sensor - the size and resolution you'd expect from a regular compact digital camera - and the 820 mAh battery is good for 1,200 stills or 1 hour 40 minutes of video. You can even attach it to a regular tripod mount. So maybe HTC is on to something here? The HTC Re may not replace your regular camera, but it might be perfect for those times when your regular camera would just get in the way. 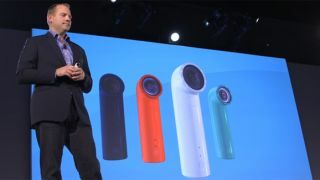 The HTC Re camera will launch in four colors - white, teal, orange, and navy blue - through recamera.com, HTC.com and various retail partners "in time for the holidays," Mackenzie said.